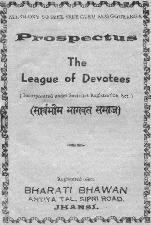 "To evoke the qualities of 'goodness' particularly (Satwa-guna) in every member of the 'League' individually by the process of spiritual initiation (Diksha) by establishing him in the status of a qualified Brahmin (good and intellectual man) on the basis of truthfulness, forgiveness, equality, tolerance, education, purity, knowledge (specific and general) and faith in the transcendental service of Godhead." "Sri Krsnadasa Kaviraja, the author of Caitanya-caritamrta, says that all good qualities become manifest in the body of a Vaisnava and that only by the presence of these good qualities can one distinguish a Vaisnava form a non-Vaisnava. Krsnadasa Kaviraja lists the twenty-six good qualities of a Vaisnava: (1) He is very kind to everyone. (2) He does not make anyone his enemy. (3) He is truthful (4) He is equal to everyone. (5) No one can find any fault in him. (6) He is magnanimous. (7) He is mild. (8) He is always clean. (9) He is without possessions. (10) He works for everyone's benefit. (11) He is very peaceful. (12) He is always surrendered to Krsna. (13) He has no material desires. (14) He is very meek. (15) He is steady. (16) He controls his senses. (17) He does not eat more than required. (18) He is not influenced by the Lord's illusory energy. (19) He offers respect to everyone. (20) He does not desire any respect for himself. (21) He is very grave. (22) He is merciful. (23) He is friendly. (24) He is poetic. (25) He is expert. (26) He is silent." Here we have a perfect description of the completely surrendered devotee. With such definitive information and criteria available, there is no room for speculating as to who is truly surrendered, and who is not. The good qualities of the demigods are automatically displayed in the character of a pure devotee. It's not that he says one thing and does another; so there is no question of acting or posing in devotional service. "A sincere sweeper in the street is far better than the charlatan meditator who meditates only for the sake of making a living." As a pure representative of the Supreme Lord, Srila Prabhupada never accepted anything for himself. He did not enjoy the facilities offered to him by his disciples and followers. Those who had the good fortune to serve or spend time with Srila Prabhupada all attest to this fact. He was cent per cent engaged in the service of Krsna twenty-four hours a day. It was his total surrender and dedication to the Lord which inspired so much love and adoration in the hearts of his followers. Prabhupada not only talked the talk, but he walked the walk. Therefore he was -- and always will be -- so endearing to godly persons everywhere.